Amazing all fleece sweaters that look like they are knitted! The warmest sweater to wear when it is chilly, breezy, and getting cold. This thick, ultra soft fleece stretches for easy on/off, has a turtleneck, a harness opening, and is fully machine washable/dryable. The colors are solid or tweeded, and made to look like a tight cable knit. An incredible advance in fleece design! 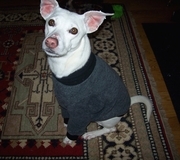 Above: Penelope, a Whippet/Terrier mix in her Smoky Tweed sweater!